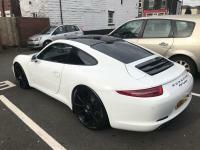 Additional information I am selling my stunning Porsche 911. The car is presented in arguably the best colour combination of Carrera White with contrasting Black Leather - a truly head turning car. It has been generously specified with the all important Sport Chrono package, PCM 3, iPod Connectivity, Bluetooth Telephone, 20" Carrera Alloy Wheels, Cruise Control, Heated Seats, Sun Protection Glass, Porsche VTS Tracking System, and Semi Electric Seats. The car is supplied with both keys and all relevant manuals, the service history. It has brand new Pirelli PZERO tyres fitted to the car. The car has just had a major service at Porsche Bolton dealership in September 18 including oil change, brake fluid change, spark plug change as well as cam belt. I had a full documentation done on the quality of the car which Porsche Bolton said was one of the finest examples they have seen. The car does not now need a service for 2 years or another 20,000 miles.